Bi-Fold doors will make a stunning addition to your Gainsborough home, with a vast number of benefits and choices, it's sure to truly transform your property. We offer competitive prices, allowing you to achieve a luxury look, whatever your budget. With a full range of colours, configurations and security options available, our bi-folding doors are fully customisable to you. Our aluminium bi-fold doors open up your home to create a seamless connection to your back garden, as well as filling your property with vast amounts of natural light. Aluminium is an incredibly lightweight, robust material, making it perfect for your new back door of your Gainsborough property. Our bi-folding doors can also be incorporated into your conservatory and are suitable for both residential and commercial properties. Available to clients in Gainsborough and the surrounding areas, these bi-folding doors will make a wonderful addition to any home. Bi-folding doors come with many benefits for you and your home, not only are they incredibly aesthetically appealing but they are also an excellent way to improve the security of your property. Aluminium is a naturally strong and sturdy material, making it virtually unbreakable. All of our bi-folding doors come with enhanced security features, meeting PAS 24:2012 standards to ensure that you, your family and your home are as secure as they possible can be. Bi-folding doors no longer reduce the security of your home, they now enhance it, keeping intruders out and providing you with peace of mind. Our bi-folding doors also improve the insulation of your home due to their aluminium frames. Starglaze Windows bi-folds are thermally broken and are designed with a polyamide thermal barrier for optimal thermal efficiency. All of these features mean that heat is not lost through the frame, unlike with other materials. Our standard, double glazed units achieve top U-values, or you can choose our 36mm triple glazed range. No matter what you choose our bi-folding doors are guaranteed to help reduce the heating costs of your Gainsborough home, saving you money in the long run. In addition to this, we want your bi-folding doors to work for you and your property and, as such, you can choose from a range of options to make sure your new bi-folding doors are exactly what you’re looking for. All of our bi-folding doors are manufactured by Sternfenster, using the Smarts Visolfold 1000 aluminium profile. This means you can decide between your doors folding in or out, to the left or the right, and whether you have the opening door at either side or in the centre. To ensure your bi-folding doors fit in perfectly with your existing property, you can choose from a range of colours and finishes to find whatever suits your Gainsborough home best. Our doors come with attractive slimline edges which can be square or round depending on your preference. We want your new bi-folding doors to work for everyone; you can choose our low threshold options which will give you far greater accessibility to wheelchairs and pushchairs. All of our bi-folding doors come with a domestic style ‘lift up’ handle, making our doors easy to use and a sash width of 1200mm. 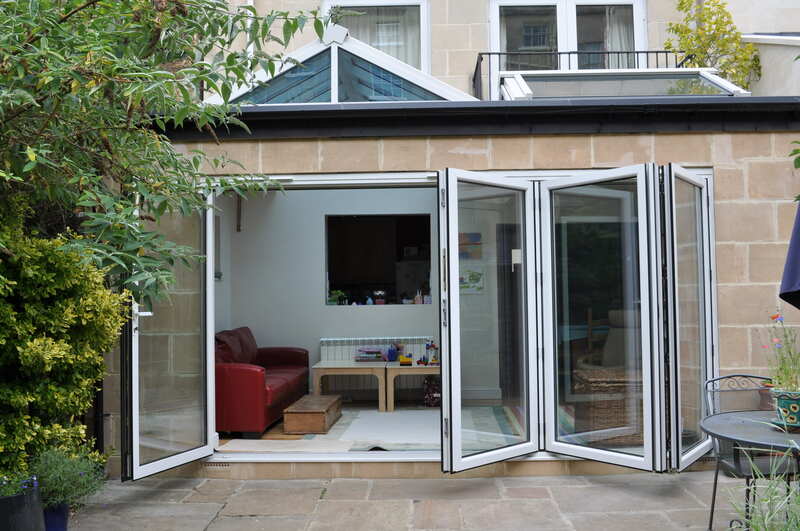 Our bi-fold doors are competitively priced and we can provide you with a quick, easy quote unique to you. To start your aluminium bi-fold door quote for your Gainsborough home, or to ask any other questions, just get in touch with our helpful and friendly team. Please call us on 01522 512020 or email sales@starglaze-windows.com or use our online contact form.